Sipiwe lived in Zambia’s bustling capital city, Lusaka, some 300km from Susu before she was abruptly uprooted when her parents passed away. Her elderly, fragile yet loving grandmother is doing the best she can to take care of Sipiwe, but her only income is rendered from the vegetables she sells from her own garden. 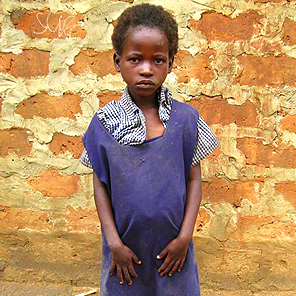 Sipiwe sleeps on the floor at home with only one blanket and often receives very little food at home. Thanks to a dedicated Susu care worker, Christopher, Sipiwe’s circumstances have begun to take a turn for the better. When Christopher came across Sipiwe, she was enrolled into the organisation’s programme for orphaned and vulnerable children. Christopher has been a consistent parental influence and encouragement for Sipiwe. He is someone who she can trust, who loves and supports her. Christopher ensures that Sipiwe attends the community school where she receives not only a basic education, but a healthy daily meal too. Sipiwe now has the energy to walk to and from school, to focus on schoolwork with a full tummy and to help her grandmother with household chores. Though Sipiwe still faces challenges and sadness, Christopher and the other care workers at Susu Home-Based Care, believe that the longer she is in their care, the more she will grow into a healthy, happy young girl. "No longer will the poor be nameless." * Hands at Work, through our model of mobilising and equipping local Christians to effectively care for the poorest of the poor, has been partnering with Susu community since 2004. Why not tell Sipiwe's story? Learn more about ADVOCATING.